More evidence that American exceptionalism has peaked. According to the first-ever scientific report ranking countries by their level of human capital, researchers have found nations failing to invest in health and education are at risk of stagnating economies. "Our findings show the association – between investments in education and health and improved human capital and GDP – that policymakers ignore at their own peril," said Dr. Christopher Murray, director of the Institute for Health Metrics and Evaluation (IHME) at the University of Washington. "As the world economy grows increasingly dependent on digital technology, from agriculture to manufacturing to the service industry, human capital grows increasingly important for stimulating local and national economies," said Murray. World Bank President, Dr. Jim Yong Kim, describes human capital as "the sum total of a population’s health, skills, knowledge, experience, and habits." As such, ranking human capital by country will give investors insights into where critical investments are needed to improve health and education. "Measuring and ranking countries by their level of human capital is critical to focus governments’ attention on investing in their own people," Kim said. 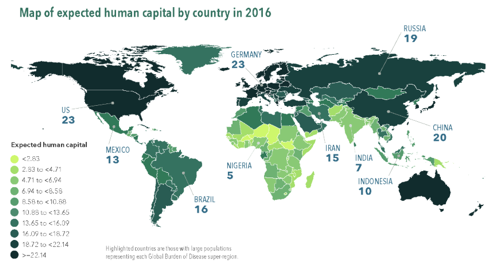 "This study from IHME is an important contribution to the measurement of human capital across countries and over time." The study, "Measuring human capital: A systematic analysis of 195 countries and territories, 1990–2016," was published last week in the weekly peer-reviewed medical journal called The Lancet. It is based on an analysis of an extensive collection of data from many sources, including government agencies, schools, and healthcare systems. 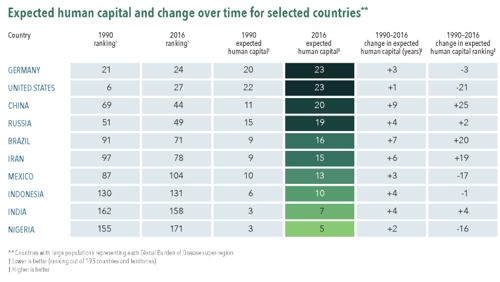 Over the past quarter-century, there has been tremendous progress in global health and education investments with Finland at the top of the list. However, the study confirms that American exceptionalism is waning, as its human capital yield has collapsed from 6th to 27th over the period. Meanwhile, China jumped from 69th to 44th, Turkey from 102nd to 43rd, South Korea from 18th to 6th, and Singapore from 43rd to 13th. "The study places Finland at the top. Turkey showed the most dramatic increase in human capital between 1990 and 2016; Asian countries with notable improvement include China, Thailand, Singapore, and Vietnam. Within Latin America, Brazil stands out for improvement. All these countries have had faster economic growth over this period than peer countries with lower levels of human capital improvement. ...The US was ranked sixth in human capital in 1990 but dropped to 27th in 2016 due in part to minimal progress in educational attainment, which dropped from 13 to 12 years during that time." "Underinvesting in people may be driven by lack of policy attention to the levels of human capital," Murray said. Murray is correct, the White House, Federal Reserve, and Wall Street have sent interest rates to 5,000-year lows, sparking the most extended bull market of all-time, producing significant wealth, health, and education inequalities, as Keynesian economics has destroyed America's middle class. 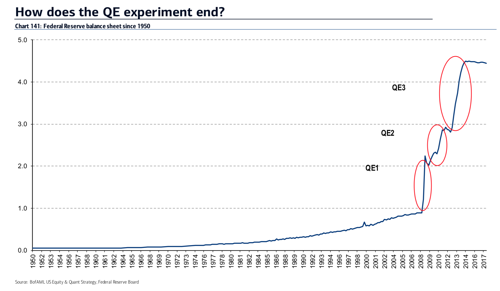 Trillions of dollars in credit via quantitative easing programs from the Federal Reserve did not flow into local communities for investments in health and education, but rather speculation in the stock market. 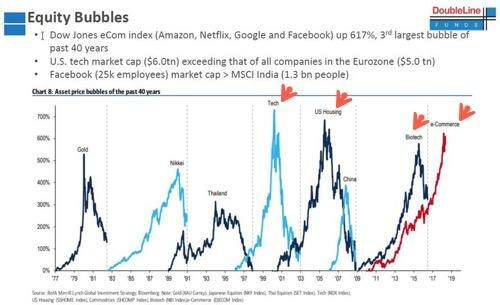 America's elites were too busy speculating in many stock market bubbles than investing in the real economy. The IHME report now enables Americans to measure investments in health and education. It will give them the ability to hold their politicians accountable for the era of gross negligence, where taxpayers funds were used for speculation and enriching the elites rather than investing in health and education in communities for the middle class. One of the most transformative themes for the 2020s will be correcting the epic inequality that has left America paralyzed. The evidence above shows that exceptionalism is dead, we must recognize the empire has peaked. Make America Great Again might be much harder than you think.